The shoulder region of the early H. erectus presents an unexpected combination of features, including relatively short clavicles and very low humeral torsion, but with a fairly modern looking scapula whose glenoid did not face cranially sitting on a barrel-shaped rib cage (judging from the shape of the ribs of KNM-WT 15000 (Jellema et al., 1993)). Although relative clavicular length is currently unknown for early hominins, if the isometric scaling relationship portrayed in Fig. 7.3 does represent the primitive condition, it seems likely that their clavicles were relatively short as well. 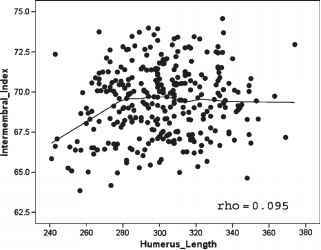 In addition, since the estimates for humeral torsion in early hominins offered by Larson (1996) are low (Fig. 7.1), the minimal degree of torsion in the KNM-WT 15000 and Dmanisi humeri may also be a retained primitive condition. 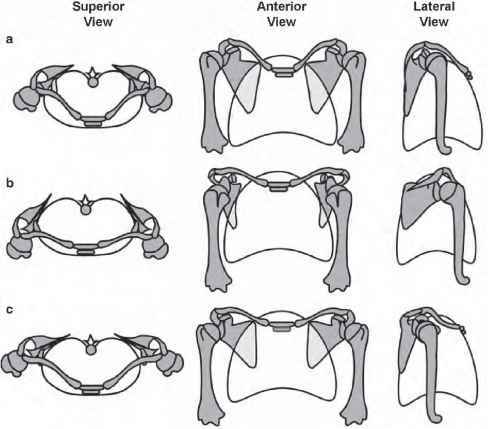 However, if these presumed primitive and derived features are combined in a modern human shoulder configuration (i.e., dorsally placed scapula with laterally orientated glenoid fossa), the resulting shoulder would seem to have poor functional capability due to the lateral set to the elbow. Perhaps then, the pectoral girdle/shoulder of early H. erectus was not configured as in modern humans. If not, the existence of a different configuration would indicate an unexpected transitional state in the evolution of the hominin shoulder. Fig. 7.4 Proposed course of hominin pectoral girdle evolution. (a) Superior, anterior and lateral schematic views of thorax showing pectoral girdle and shoulder of early hominin condition. Scapulae are dorsally positioned with a cranially facing glenoids, and clavicles are short and oriented obliquely resulting in a "hunched-shoulder" appearance. Humerus displays low to modest torsion. (b) Proposed transitional stage in hominin pectoral girdle evolution in which change from a cranially oriented glenoid fossa has been brought about in a way analogous to a downward rotation and translation of the scapula, constrained by a relatively short clavicle. Scapulae are more laterally positioned, and glenoid fossae face anteriorly. Parasagittal functioning of the elbow joint is maintained without major increases in humeral torsion. Such a configuration would explain the low degree of humeral torsion and relatively short clavicles seen in early H. erectus (KNM-WT 15000). (c) Pectoral girdle and shoulder of a modern human with elongated clavicles, dorsally positioned scapulae and laterally facing glenoid fossae. The humerus displays marked torsion to maintain a parasagittal plane for elbow function. clavicle resulted in a forward as well as downward shift in position so that the scapula came to be more laterally positioned on the thorax (Fig. 7.4b). As a consequence, the glenoid fossa came to face anteriorly, and thus a humeral head that faced posteriorly, that is, had low to modest torsion, would produce an elbow that functioned in a parasagittal plane putting no restrictions on using the forelimbs for manipulation. This scenario therefore could explain the combination of pectoral girdle/shoulder features observed in early H. erectus. Remarkably, an abnormality found occasionally in modern humans known as short or hypoplastic clavicle syndrome (Milgram, 1942; Guidera et al., 1991; Beals, 2000; Beals and Sauser, 2006) appears to closely mimic this configuration. Individuals typically present with significant forward displacement of the shoulders due to laterally positioned scapulae and resulting anteriorly directed glenoids. The vertebral borders of the scapulae are widely separated and are often prominent posteriorly. Other than their shortened length, the clavicles are normal in appearance. There are typically no other associated abnormalities or upper extremity dysfunction, and the chief complaint is abnormal posture. Unfortunately, the case studies describing short clavicle syndrome tend to be brief and offer little information beyond the appearance of the patient's shoulders. Although none report on the degree of humeral torsion in patients with this condition, Guidera et al. (1991) notes that the humeri are located anteriorly on CT scans. Given that humeral torsion is somewhat plastic developmentally (Krahl, 1947; Edelson, 1999, 2000), it would seem likely that these individuals have reduced humeral torsion to accommodate the anterior orientation of their glenoid fossae. Indeed, the pronounced similarity between individuals displaying short clavicle syndrome and the shoulder configuration suggested here for early H. erectus leads one to wonder whether we are simply seeing examples of this syndrome in the fossil record. However, it would seem unlikely that both the Nariokotome boy and the Dmanisi hominins would display the identical pathological condition, suggesting that the pectoral girdle/shoulder configuration described above is truly characteristic of early H. erectus. What is glenoid down rotation?